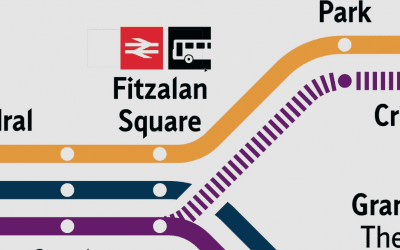 Helping people get to their destinations on public transport, with minimal stress and maximum support, depends on cleverly designed customer information – whether it’s take away printed items, static on-site signage or maps. We are experts at making customer information instantly understandable and determining what is needed at the different points of the customer journey. 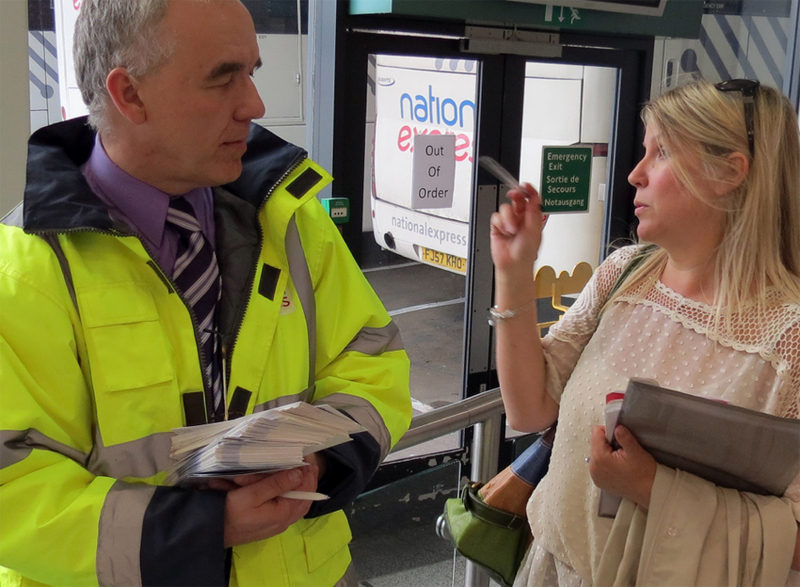 National Express coaches got in touch with us to help with their customer information and review all their customer touchpoints. In order to truly understand their customer’s perspective, we immersed ourselves in the experience. In fact, before we undertake any project to review customer information, we ride the trains, coaches, buses, trams or boats that make up our client’s network. We book journeys and find our way from place to place using the customer information available. We talk to staff and other passengers, record the anecdotes, and photograph everything. 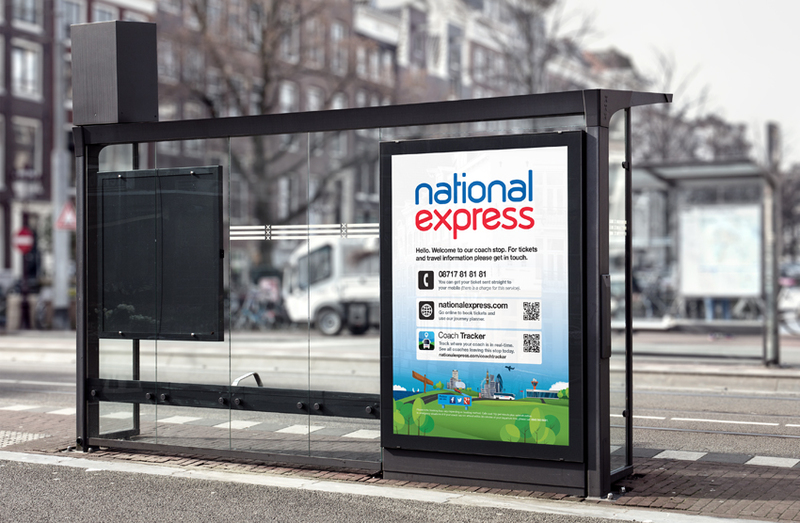 For National Express, like our other clients, this gave us a first-hand insight into the customer’s viewpoint. We turned the evidence into a large ‘scrapbook style’ book, which told the story for our clients and their stakeholders to truly get the picture. This is the best way to start, and the process uncovered many previously unknown issues. 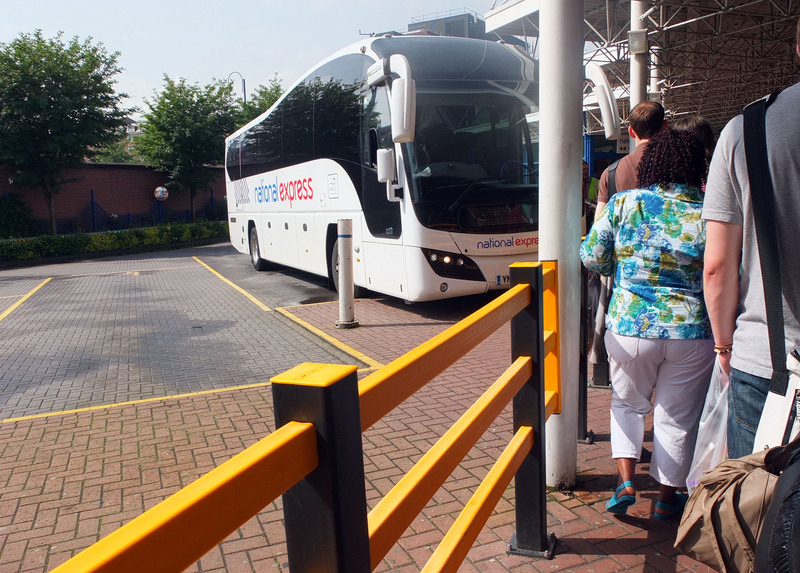 Our 160-page findings report for National Express identified the good, the bad and the ugly – and helped them prioritise their projects and budgets for years to come. Armed with this extensive knowledge, we were able to confidently identify where quick wins could be made, and start to scope the requirements for longer-term projects. One of our first challenges was to redesign the complicated ‘stops posters’. 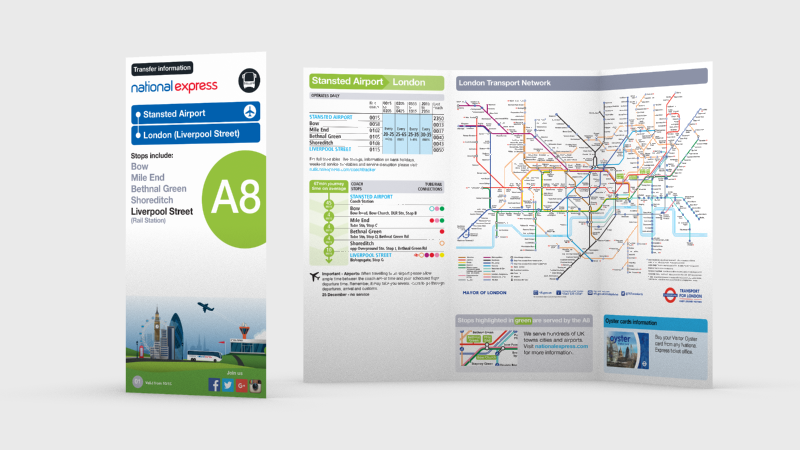 Each stop would have its own unique poster but soon after being printed and installed they were out of date, due to frequent route changes. The level of detail on them also meant they were hard to read. Our solution was to move towards a standardised poster, which was clear and accessible. It would not go out of date as it directed passengers towards the many ‘live’ information sources both online and on the phone. 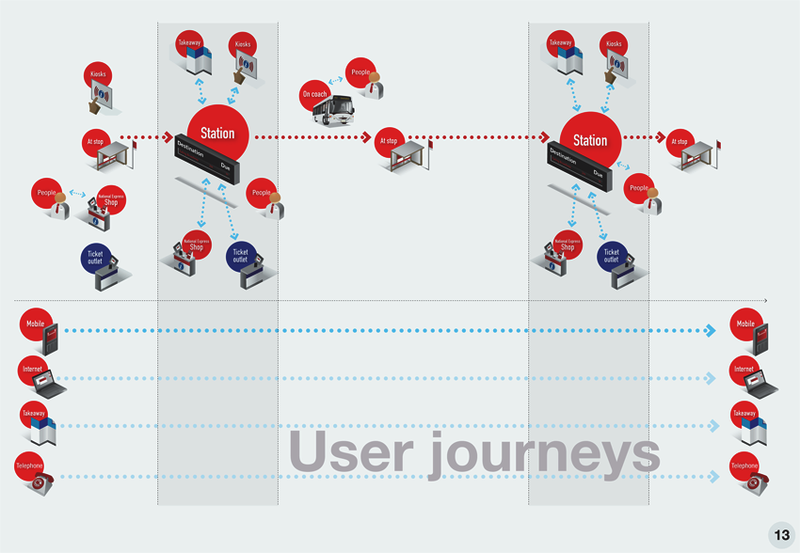 Our next challenge was to redesign the suite of almost 100 coach timetables. The covers of the old suite carried little information, so when racked it was difficult for hurried passengers to select the right one. We redesigned the information and created and new suite. While consistent in format these could be easily identified thanks to the hierarchy of cover information. What’s more, we designed them with a consistent column structure to bring down production timescales and cost. 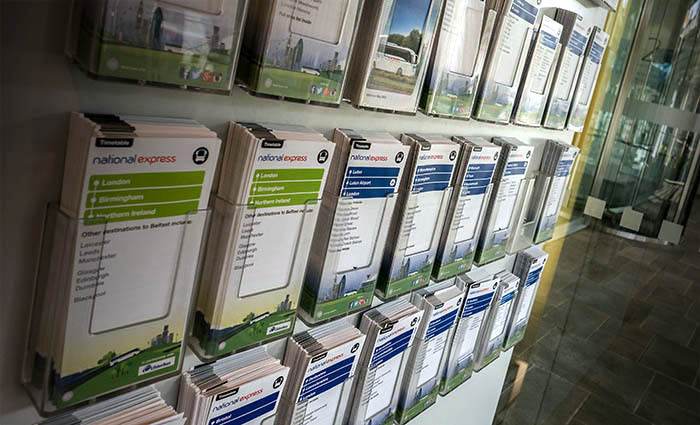 Working with the Marketing and Communications team at National Express (and their employees across the UK) have allowed us to demonstrate the importance of how concise, streamlined information design can communicate effectively. 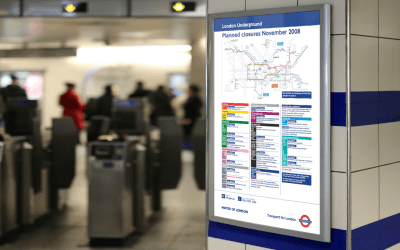 Further to National Express, we have worked on information design projects for many other clients in varying sectors, including Transport for London, BAA Heathrow, Toyota, Marsh, Thomas Miller, Catlin XL, and CIOB. The Demographik team were keen to get their sleeves rolled up and out on our network to get a clear view of the customer experience and the reality of traveling in the UK by coach. This attention to detail along with a collaborative, supportive style made them a pleasure to work with and I’d be happy to recommend them for similar projects. 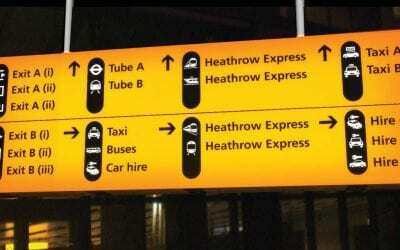 BAA Heathrow commissioned Demographik to design a suite of pictograms to be used in the airport, to direct people from all around the world to the right place. Creating a simplistic and unified system only comes through working through a detailed process.